The Preacher’s Daughter is a cautionary tale about a college-bound beauty who chooses to follow her heart rather than take heed to the warning of her father. It’s a decision that sets up a chain of events in her life that can’t be undone and one that she’ll later regret as she strays from her father’s iron hand and is sucked into a hustler’s world. “In its’ bareness, The Preacher’s Daughter is about the power of love and its’ ability to camouflage right as wrong,” says Dunn. If the storyline of a young girl being led astray seems all too common…don’t sleep on Dunn. 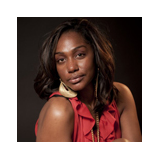 She brings urban-fiction readers a storyline with more twists and turns than your favorite rollercoaster at Six Flags! But, Dunn is quick to mention that her purpose as an author is not only to entertain readers but also to enlighten them—shining the light on many of life’s social ills. “The Preacher’s Daughter delves behind the glitz and glamour associated with being a hustler’s girl or somebody’s wifey so to speak and into the beatings and bruises,” Dunn hints at the domestic violence often present in such relationships and explored in her debut novel. My father's church was on one end of the block and Slay conducted business on the other. It was a street that, depending on which direction you were going, led you to heaven or to hell -- my father forbid me to travel to hell. At the time, I didn't have the fortitude to tell him that as a disciple of the Lord, down on the corner is exactly where he needed to be -- slinging scriptures as the dope boys slung rocks. I disobeyed my father's commandment and followed my heart -- a decision that, indeed, led me to hell. With her debut novel, The Preacher’s Daughter, Kendra Dunn has exploded onto the urban-lit scene with a cautionary tale about a college-bound beauty who chooses to follow her heart rather than take heed to the warning of her father. It’s a decision that sets up a chain of events in her life that can’t be undone and one that she’ll later regret as she strays from her father’s iron hand and is sucked into a hustler’s world. “In its’ bareness, The Preacher’s Daughter is about the power of love and its’ ability to camouflage right as wrong,” says Dunn. If the storyline of a young girl being led astray seems all too common…don’t sleep on Dunn. She brings urban-fiction readers a storyline with more twists and turns than your favorite rollercoaster at Six Flags! But, Dunn is quick to mention that her purpose as an author is not only to entertain readers but also to enlighten them—shining the light on many of life’s social ills. “The Preacher’s Daughter delves behind the glitz and glamour associated with being a hustler’s girl or somebody’s wifey so to speak and into the beatings and bruises,” Dunn hints at the domestic violence often present in such relationships and explored in her debut novel.